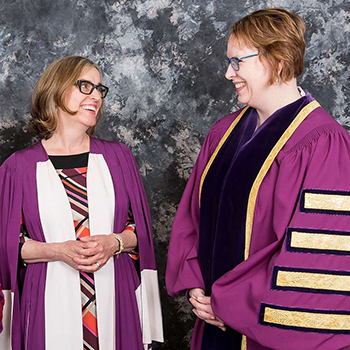 Influential journalist Nora Young and accomplished mental health advocate Mary Deacon were recognized with honorary degrees during spring convocation ceremonies at Laurier. Laurier confers honorary degrees in recognition of the commitment, dedication and service of individuals who make significant and sustained contributions in their areas of expertise. Nora Young shares a laugh with Laurier President Deborah MacLatchy following a spring convocation ceremony in Waterloo. Young, the creator and host of CBC Radio One’s Spark and author of The Virtual Self, is considered one of Canada’s superior storytellers in addressing how technology is transforming our lives and the world around us. Young also works to inspire youth and young women in the fields of science, technology, digital media and journalism. Deacon, chair of the Bell Let’s Talk campaign, is known for her passionate advocacy work and leadership in mental health issues. During the past 25 years, she has held senior positions in the non-profit sector, including as the president of the Centre for Addiction and Mental Health Foundation. Deacon is also a member of the World Economic Forum's Global Agenda Council on Mental Health. Linda Fabi (BA '75, MA '82) was presented the Order of Wilfrid Laurier University during spring convocation. A leader in education both in Waterloo Region and at Laurier, Fabi spent her 43-year career inspiring youth and children, as well as those who teach them. As the director of the Waterloo Region District School Board, Fabi supported the development of Laurier's Faculty of Education and continues to serve the faculty on the Dean’s Development Advisory Board. The Order of Wilfrid Laurier recognizes exemplary and distinguished service to the university by members of the Laurier community.